New variety. Reminiscent of a Cuban sky, the huge striking blue flowers with white hearts and deep purple veins have a fluorescent feel to them that they almost seem to glow. Flowering from July until the first frost over stunning yellow green foliage rabbit resistant, trouble free and very easy . Sun or partial shade. Height & spread 40cm. New. 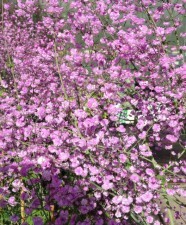 The best pink Gypsophila to date masses of tiny pink double flowers through summer. Also makes a good cut flower. Height 90cm. Good light. Outstanding bright orange cultivar with clusters of flat-headed flowers on tall upright stems. Drought resistant plant. Sunny, well drained spot. 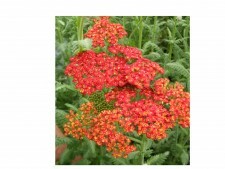 Height 60cm.Achillea hybrids flower from summer to early autumn. Irresistible to butterflies. Excellent fresh cut flowers or dried. Tolerant of drought, wind and heat. Grows well in almost any soil type. A super perennial with dark green leaves. Orange-red flat topped flowerheads Height 80cm. Flowers from June to September. Achillea hybrids flower from summer to early autumn. Irresistible to butterflies. Excellent fresh cut flowers or dried. Tolerant of drought, wind and heat. Grows well in almost any soil type. This is one of the loveliest forms. It flowers from late July and grows to around 120cm. The amount of red in the petals varies with temperature and light levels. The name means "Fiery Seal": very apt for the forked streaks of red radiating from the centre of the flower. RHS Award of Garden Merit. A recent introduction. Deep red to copper-red daisy-like flowers with large prominent, red and saffron centres and widely spaced and fluted petals. Compact variety. Good in container or garden., Much loved by bees and butterflie. Does best in full sun. Good cut flower.Ht 60cm. Super repeat flowering perennial. Ideal for pots or front of a border. New. 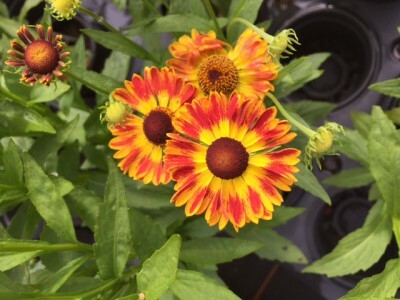 A spicy Helenium from the Mariachi series, 'Salsa' offers the brightest red tones ever on a Helenium, all surrounding a deliciously golden/chocolate center! The straight stems show the blooms off proudly in the garden or vase, inviting bees and butterflies over for a sip! 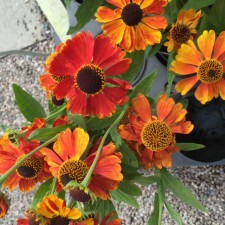 Bred by Arie Blom of AB-Cultivars in The Netherlands, this Helenium is one of the most compact, bushy, and colourful yet! Height 45cm. Cherry red form of with flat heads of jewel like flowers.in summer.The fine ferny foliage is beautiful all the year round. 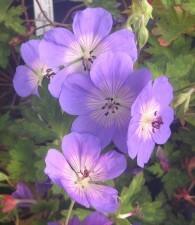 As well as being a lovely border plant, the flowers are very good for cutting. The height is approximately 50 cm. A perennial with light green aromatic ferny leaves. Clusters of golden yellow flowerheads produced in summer. Height 1.2m. Spread Flowers from June to September. Evergreen. Bred for their compact growth, vigor, and uniformity of flowers. 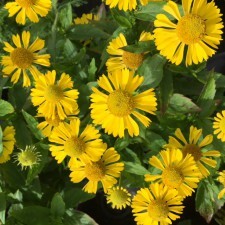 Yarrows are valuable garden plants from the North Temperate Zone that are widely grown for the masses of flowers they bear throughout much of the summer. Their flattened flower heads introduce a fresh shape into the perennial border. Yarrows thrive in full sun and well-drained soil. They bloom from June to September. Excellent as cut flowers, fresh or dried. This lilac-mauve achillea matures to a dignified silver-rinse grey - making the perfect foil for other vibrant garden colours. Achillea hybrids flower from summer to early autumn. Irresistible to butterflies. Excellent fresh cut flowers or dried. Tolerant of drought, wind and heat. Grows well in almost any soil type. Bred for their compact growth, vigor, and uniformity of flowers. Yarrows are valuable garden plants from the North Temperate Zone that are widely grown for the masses of flowers they bear throughout much of the summer. Their flattened flower heads introduce a fresh shape into the perennial border. 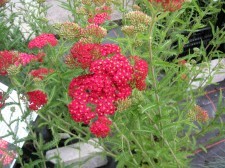 Yarrows thrive in full sun and well-drained soil. They bloom from June to September. Excellent as cut flowers, fresh or dried. Valuable in the garden combing well with most plants good foil for many darker colours. With flat topped canary yellow flower clusters from May to September. Height 60cm. Achillea hybrids flower from summer to early autumn. Irresistible to butterflies. Excellent fresh cut flowers or dried. Tolerant of drought, wind and heat. Grows well in almost any soil type. bred for their compact growth, vigor, and uniformity of flowers. Yarrows are valuable garden plants from the North Temperate Zone that are widely grown for the masses of flowers they bear throughout much of the summer. Their flattened flower heads introduce a fresh shape into the perennial border. Yarrows thrive in full sun and well-drained soil. They bloom from June to September. Excellent as cut flowers, fresh or dried. 'Pink Lady' sports large, slightly domed flower heads that open a deep rose-pink, then fade harmoniously to pale creamy rose. 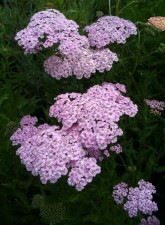 Achillea hybrids flower from summer to early autumn. Irresistible to butterflies. Excellent fresh cut flowers or dried. Tolerant of drought, wind and heat. Grows well in almost any soil type. bred for their compact growth, vigor, and uniformity of flowers. Yarrows are valuable garden plants from the North Temperate Zone that are widely grown for the masses of flowers they bear throughout much of the summer. Their flattened flower heads introduce a fresh shape into the perennial border. Yarrows thrive in full sun and well-drained soil. They bloom from June to September. Excellent as cut flowers, fresh or dried. Broad heads of strong pure red flowers, which keep their colour well. Achillea hybrids flower from summer to early autumn. Irresistible to butterflies. Excellent fresh cut flowers or dried. Tolerant of drought, wind and heat. Grows well in almost any soil type.height 60cm. bred for their compact growth, vigor, and uniformity of flowers. Yarrows are valuable garden plants from the North Temperate Zone that are widely grown for the masses of flowers they bear throughout much of the summer. Their flattened flower heads introduce a fresh shape into the perennial border. Yarrows thrive in full sun and well-drained soil. They bloom from June to September. Excellent as cut flowers, fresh or dried. Broad heads of strong pure red flowers, which keep their colour well. 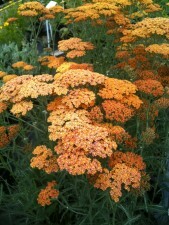 Achillea hybrids flower from summer to early autumn. Irresistible to butterflies. Excellent fresh cut flowers or dried. Tolerant of drought, wind and heat. Grows well in almost any soil type. bred for their compact growth, vigor, and uniformity of flowers. Yarrows are valuable garden plants from the North Temperate Zone that are widely grown for the masses of flowers they bear throughout much of the summer. Their flattened flower heads introduce a fresh shape into the perennial border. Yarrows thrive in full sun and well-drained soil. They bloom from June to September. Excellent as cut flowers, fresh or dried. Lovely soft red flowers keep their colour even as they finish. Flowers Main early summer then sporadicly until November. easy Delicate filigree foliage . Bred for their compact growth, vigor, and uniformity of flowers. Yarrows are valuable garden plants from the North Temperate Zone that are widely grown for the masses of flowers they bear throughout much of the summer. Their flattened flower heads introduce a fresh shape into the perennial border. Yarrows thrive in full sun and well-drained soil. They bloom from June to September. Excellent as cut flowers, fresh or dried. These stately delphinium-like plants produce spikes of hooded flowers and clumps of deeply cut leaves. Perennial. Sun or shade. Height 60 to 100cm. Monkshood These stately delphinium-like plants produce spikes of hooded flowers and clumps of deeply cut leaves. Perennial. Sun or shade. Height 60 to 100cm. 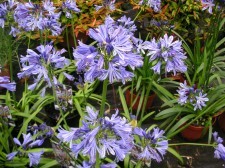 This vigorous upright perennial is peaked with loosely branching spikes laden with well formed, hooded steely blue flowers. The mid-green foliage is finely divided and lobed into narrow sections. height 40". Partial shade. Excellent for cut flowers. Spectacular new Agapanthus. Flowers continuously through summer and autumn. Beautiful blue flowers are produced from June to October. Can also be used for cut flowers. Height 90cm. New variety, Charlotte. Small in stature but full in body, stout plants with an abundance of very full, fat, bright, vivid blue heads on sturdy stems. Excellent repeat flowering form. Height 60cm. We had them in still in flower at Christmas in an unheated glass house! Impressive groups of erect stems, carry large heads of rich blue tubular-bell shaped flowers, which cloud over the green strap shaped leaves of this beautiful perennial plant. 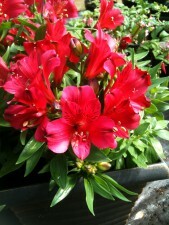 Looks fantastic in a patio container or border. 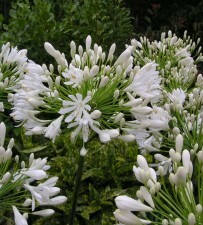 Impressive groups of erect stems, carry large heads of tubular-bell shaped white flowers, which cloud over the green strap shaped leaves of this beautiful perennial plant. Just named as plant of the century! Simply superb. 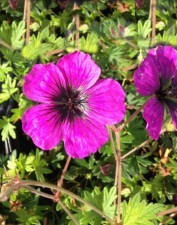 Named in honour of the honey bees that pollinate plants at its home nursery, Jolly Bee (now renamed as Rozanne) is a large, mounding Geranium which is smothered in flowers the whole summer, and well beyond. For a brilliant show in container or border. 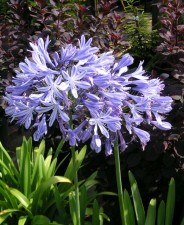 The distinctive 5cm flowers are bright blue with a large white eye. The plants and flowers are more robust than average, and will continue to bloom until first frosts. This plant is a definate 'must have'. Most colourful yet! Blooms feature a golden yellow halo surrounding a chocolate brown cone with petals of fiery orange. From the Mariachi series, set the late summer garden ablaze with vibrant blooms . 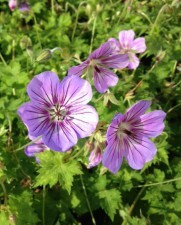 Stunning in borders and wildflower gardens. The tall flower stems are great for fresh bouquets.Height 45cm to 60cm. Butterflies and bees love this plant. 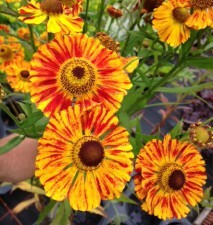 Helenium 'Mardi Gras' produces a festival of multicoloured blooms jazzes up the garden in mid to late summer. Yellow petals are lavishly edged with bright orange red, ageing to clear red edged in gold, all surrounding deep chestnut cones. Gorgeous in a pot! Great as a cut flower, its long stems are sturdy and vase life is long. 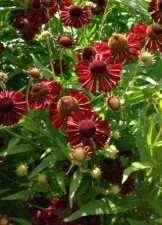 Heleniums are naturally resistant, to deer and rabbits. An early pinch back helps promote branching. 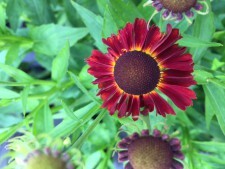 A new selection of compact Helenium. Bold shuttlecock sunshine yellow blooms appear during summer and autumn. Ideal for cutting, long flowering, deer and rabbit resistant but loved by bees and butterflies. Prefers well-drained soil in sun or part shade. Height and spread 45-60cm This compact variety is part of the Mariachi Series.